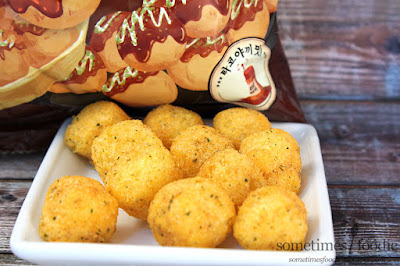 Sometimes Foodie: You guys want some Octopus Balls? You guys want some Octopus Balls? For those of you unfamiliar with "takoyaki," it's bite-sized pieces of octopus, coated in thick batter, and baked in small sphere-shaped molds. Once cooked, they are topped with sauces, seaweed, green onion and fish flakes. To the typical American, it sounds a little odd, and believe me, a few years ago I was turning up my nose at it, but after giving it a try I can see why this street food is so popular. I'm still not a fan of the bouncy eraser-like texture of the octopus inside, but everything else about takoyaki is great! Fried dough, mayo, BBQ-like takoyaki sauce, fish flakes, onions and seaweed are an AMAZING combination! 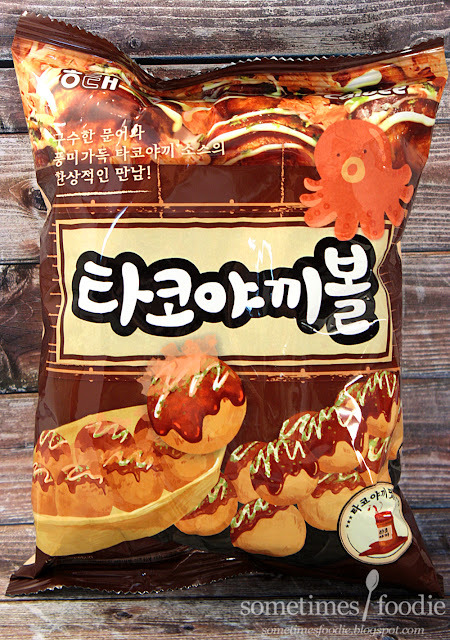 Since I'm not a huge fan of the octopus chunks inside (mostly due to their texture) I'm really hoping these snacks will deliver all the takoyaki flavor I love, but with the delightful texture of a cheese puff. Will these octopus balls live up to my expectations? 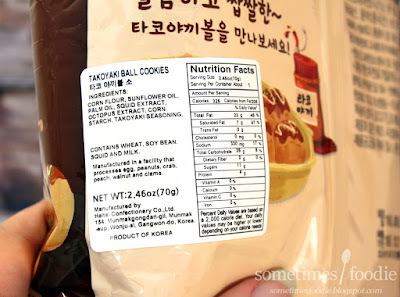 Even though the packaging is mostly a muted brown color, the chunky black and white characters caught my eye on the shelves and when I took a closer look I noticed these were takoyaki flavored? Insta-buy. I tossed them right into my handcart. The packaging isn't all that exciting, but the product inside should be, right? Inside the bag are a bunch of chunky puffed snacks. 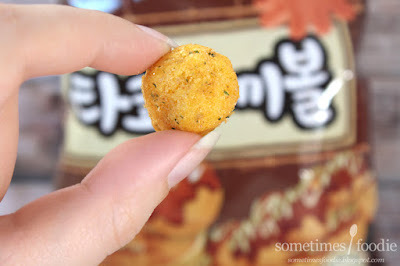 They have a yellow-orange tinge to them with flecks of seasoning, and they look kind of like the real deal, mixed with cheese balls. I approve. However, they smell...interesting. It's not the seafood aroma that's putting me off (fyi there is octopus extract in these, how to you make octopus extract? Do I even want to know? ), it's how sweet these smell. Why do these smell like a BBQ octopus flavored breakfast cereal? My excitement has quickly turned into concern. Being the adventurous foodie I am, I popped a little octopus puff into my mouth anyway. The first flavoring I noticed on my tongue was a smokey, but incredibly sweet, takoyaki sauce. 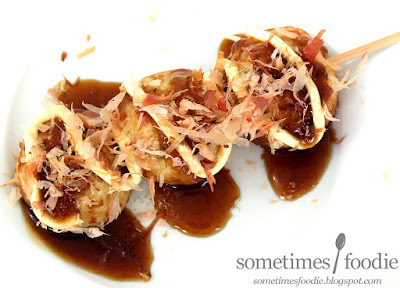 Takoyaki sauce is a thin, sweet, and smokey BBQ-style sauce, and I actually have a bottle of it in my pantry, but this is WAY sweeter than any takoyaki sauce I've ever had before. After I get past the sugary smokey flavoring, you get a hint of generic seafood flavor followed by a decent punch of octopus. These are not BAD. You have crunchy corn puffs, smokey seafood flavoring, and a fairly authentic octopus flavoring, but they are WAY sweeter than I'd like them to be. Unless you like your octopus served with a sugary breakfast-cereal-shell, I suggest skipping these and munching on the real thing. I usually buy takoyaki in the freezer section at H-mart, and they also stock all the fixings I could ever desire. Here is a little post I made a few years back with the real thing. THAT I'd recommend, these puffs? No, thank you.